Stop what you are doing and read Emil Kadlec’s Introduction to STOMP Fantasy Football Draft Theory again: http://www.footballdiehards.com/fantasy-football-columns/html/STOMP-Fantasy-Football-Draft-Theory.cfm. This piece is thorough and understanding how to apply STOMP drafting is necessary in order to use the tool properly, and reading it more than once is a great idea. Welcome back. Emil and I joined an MFL25 2x before the MyFantasyLeague.com lobby closed and I went into this draft will a downloaded csv of my STOMP map that I created. For those of you who don’t know what an MFL25 2x is, it is a $25 best ball league where the top five finishers double their money and sixth place earns a free credit in 2018. Much like a 50/50 in daily fantasy football, the top half of the pool cashes. This format was introduced this seasons, as was the STOMP theory, so we figured we would marry the two and apply the innovative approach to the innovative league. What differentiates STOMP drafting from essentially every other strategy is that we lay out a map of what players we want and work off of that. There are many theories and strategies out there, but none where you go into your draft with all of your target players mapped out for you with round-by-round suggestions of where you should draft these players based off average draft position and your draft position. Bringing rankings to a draft is wise and typical, but bringing a layout of what your ideal draft result will look like is even better. Drafted: Mike Evans, 1.06 With Odell Beckham off the board, I still had three of my targeted players available to me. I went completely off the grid and selected Mike Evans, feeling confident Bryant, Baldwin, or Elliott would be available to me in the second round. With Elliott being selected 2.01, my first round targets and Crowell were all there for the taking. I felt good about Bryant falling to the second and he did. Injuries have plagued him for the past two seasons, but 2017 has been his first injury-free and contract dispute-free offseason, as well as his first full offseason with Dak Prescott. There isn’t a receiver in football with his touchdown upside. At this point, I am now targeting Crowell in the third round. Both Baldwin and Crowell were sniped before my third pick and they are players I should have taken where the STOMP tool told me to if I really wanted them. I did really want them, but we only get one pick per round. Feeling a bit early for my other targeted players, I went with Demaryius Thomas. Despite peak-and-valley quarter back play, Thomas has five straight 1,000 yard seasons. Regarding Edelman, this draft started on 8/24/17 and he tore his ACL the following night. Full Disclosure: This was an auto-pick, though right in line with his ADP. The MFL lobby closed for good on 8/24/17 and, feeling like I needed to join many leagues as I could, this pick was lost in the shuffle. Shame on me, but Mixon is largely considered one of the most complete backs of this draft. The backfield committee concerns me, but if the talent wins out this is a great spot for Mixon. There was simply no way I was passing on Reed here, who is a better option than Eifert. I wanted an elite tight end here and input Eifert into the STOMP tool to pivot off of Greg Olsen, who I have many fifth round shares of. Reed has similar injury concerns and touchdown upside as Eifert, and I have him ranked above Eifert. At this point I am rolling the dice that Decker will be available a few rounds later. If Gillislee fills the “Blount” roll and only puts up 50% of the production Blount did, he will pay off in the sixth. Having felt the remorse of not taking a receiver with my last pick, I decided to go with the ultimate boom-bust receiver in Jackson. He is an ideal bestball receiver and a nightmare in redraft. His huge weeks are what we are looking for in this format. Decker, Blount, and Cousins are still on the board. Got my guy two rounds later. I pushed the envelope with ADP on nearly every player thus far and missed out on a few so it was important to me to land Blount here. He is just like Gillislee in the sense that if he puts up 50% of the production he did in New England, he will be a lock in the late eighth. I drafted Blount here with my Round 6 target Decker still on the board and my Round 8 Britt target, determined to grab one of them next. As nice as it was to land Britt, I waited too long on Decker and lost him. At this point in the draft I am working loosely with my STOMP targets and chasing my players who fell. Britt had a successful 1,000 yard season with the Los Angeles Rams, proving that he can perform on a bad team. Getting the Browns WR1 in the ninth round is a value pick. I rolled the dice yet again and pushed a pick a round. Dalton’s ADP is exactly one round later at 11.07. Targeting him in the ninth, passing, and landing him a round later here in the tenth was just about as far as I could push it. Since my Britt pick in the ninth there was a quarterback run where six were selected before I took Dalton. There was no way he was making it to the 11th round after that run. Another thousand words on the second half of this draft will be daunting for both of us. Use the link at the beginning of this piece to follow this ongoing draft in real time. Keep an eye on what Emil Kadlec is doing – he not only created the format (http://www.footballdiehards.com/fantasy-football-columns/html/fantasy-football-best-ball-leagues-history.cfm ) but he is pretty damn good at it, and if you have any last minute drafts you can certainly learn a thing or two by studying his style. What STOMP has in common with every other fantasy football strategy or theory is that drafts can be unpredictable and sometimes we miss out on our guy or blow him off for a better value. Drafts evolve in real-time and adaptation is a crucial element to a successful draft. I missed out on some of my STOMP targets here but was able to snag a handful of them a bit later than anticipated. 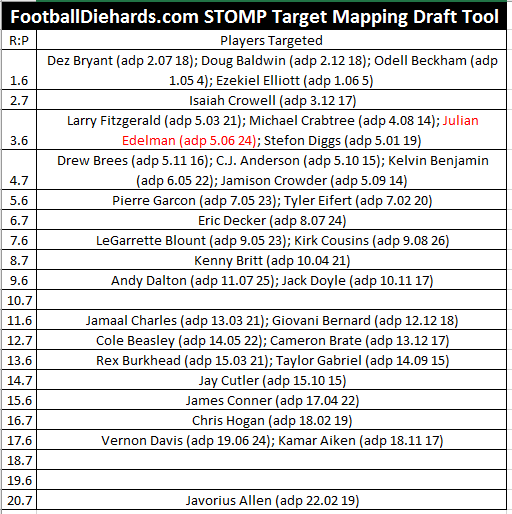 The round by round layout of the STOMP map is a unique approach where you select players you are targeting for your team and the tool generates an ADP guideline of where to select that player relative to current ADP. Get in there while you can and give the STOMP tool a shot.